With so many retailers flocking online to make their products available to customers… the market place is becoming so cluttered and confusing. It is hard to know which retailers are legitimate, which products are reliable and if you can trust them. 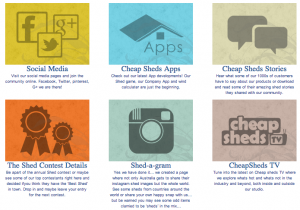 Cheap Sheds however has been around since the inception of online shed retail and have spent countless hours and days, even years, focusing on providing customers the best shopping experience possible. We have just launched our new and improved website design which again we kept, you the customer in mind through each new development. It’s chic, professional and much easier on the eye. You can now navigate our website more easily and feel at home in the clean and simple design. Don’t you hate having to click through pages and pages of products? Well we have introduced ‘endless scrolling’ which means the products will automatically be added to the end of the page once you have scrolled to the bottom. It makes searching easier and saves you time. We love this feature! Our Product Menu has been moved to the top bar which means you can access it wherever you are on the website plus we have broken all our products up into easy to understand categories. Some retailers ‘search boxes’ are very limited and are sometimes not very helpful. Ours have been upgraded to ensure it can assist you quicker and more accurately than before. You can now catch up with all the latest hubbub in the online DIY retail world by visiting our social centre. You can connect with us on your preferred social platform or simply see what’s been happening. This is our pride and joy and we are so excited to launch our ‘Help Centre’. 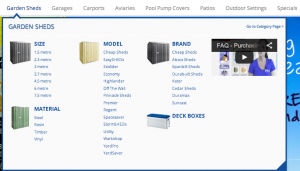 This is the go-to centre for any information you require regarding storage solutions for the home or backyard, our products, your city recommendations, info about the shed and DIY industry, tips and so much more. You will be able to browse our video and article library, helpful apps and news etc. Many people get frustrated at the 10-step checkout process some retailers have on their sites. It is time consuming, irritating and what’s worse… if there is an error in the process, you generally have to start again. This is why we simplified our process to have it done all in one go to make sure we don’t waste your time. 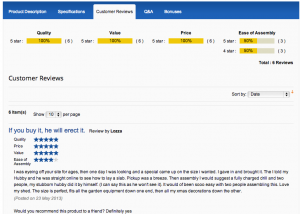 We have invited our customers to leave reviews about our products on the website which you can see on the product pages. This will help you get a better idea of our products from people other than ourselves. We are always running contests or giving away freebies to our customers and followers. We have given away holidays, sheds, cash, movies vouchers and plenty of other things. So we decided to create a ‘Wall of Fame’ to showcase our lucky winners. – Our staff are available to help you with any queries right now! – Detailed information about our products to help you understand them better and put them up without a hitch. Why not check out our website and let us know what you think! We would love to hear your feedback and of course if you have any suggestions for our next upgrade we would love to hear from you.